Why is your Jack going bald? If your Jack Russell terrier starts losing hair, a genetic element could be at fault. While Jacks are notorious shedders --you already knew that -- bald spots are a different story. He probably has other symptoms, with hair loss the most noticeable. Take him to the vet for a complete work-up. 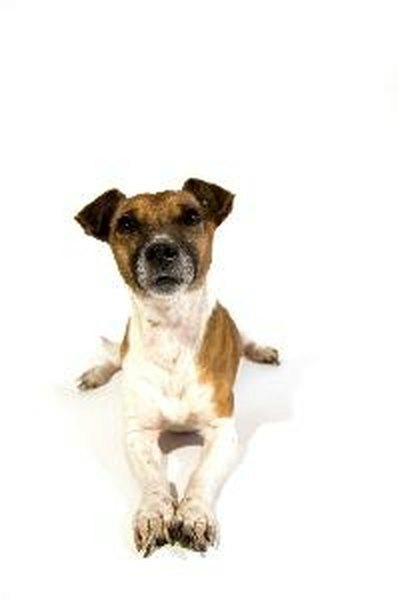 Hair loss is one symptom of hypothyroidism, a condition common in Jack Russells. If his skin appears rough or scaly and he's gaining weight for no obvious reason, suspect this thyroid problem. His thyroid is not producing enough hormone to regulate various metabolic tissues. Only the vet can make a definite diagnosis. After the examination, your vet will take a blood sample if she suspects hypothyroidism. Diagnosis is by means of various blood tests determining thyroid hormone levels. The T4 test measures total thyroxine, the primary hormone supplied by the thyroid glands. Because T4 levels in the blood vary according to illness and other issues, additional tests are necessary. These include the thyroid-stimulating hormone test. If diagnosed with hypothyroidism, your dog needs to spend the rest of his life on thyroid medication to remain healthy. This medication, the synthetic hormone levothyroxine, generally reverses hair loss and other symptoms within a few weeks of administration. You will need to bring your Jack to the vet periodically for blood tests so his dosage can be adjusted, if necessary. If your Jack doesn't suffer from hypothyroid, an allergy could cause his hair loss. Jack Russells are one of many breeds subject to atopy, or hair loss due to environmental allergies. He could be allergic to specific triggers or just about anything. Your vet needs to conduct allergy tests to determine actual causes. Atopy usually manifests itself in fairly young dogs. If your Jack is middle-aged or older, it's probably not what's causing his hair to fall out. In addition to hair loss, atopic dogs itch and suffer from skin ailments. After diagnosis, your vet can design a treatment plan depending on what sets off your dog's allergies. It can include immunotherapy shots, dietary changes and medication. What Are the Causes of Cats Being Itchy & Pulling Fur Out of Their Tails? How Fast Does a Yorkie Puppy's Hair Grow After Cutting It?